IMECE protect lives and strengthen societies. Take action and become part of this change. Women are stronger when they are together. Become a member to support and improve IMECE’s services for the rights of the women and transforming communities. 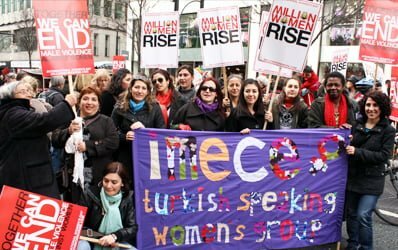 IMECE just like any other women organisation depends on volunteers to assist their crucial work. Our volunteers take part in running advice and information line, providing interpreting and translation, accompanying women and children to other services, organizing events, facilitating workshops (recycling and drama) and many other activities. As volunteer you will receive continuous support, supervision, free training and job search assistance. IMECE helps women to empower and improve the quality of their lives. With your support we could assure a better and equal provision of the essential services to women and children. IMECE is directed by Board of Trustees, who is in charge of making sure that the organisation has evident policy, which stands valid for its initial idea. The trustees are responsible for the organisation’s strategy to fulfil all vital rules and official requirements. IMECE is always looking for women to fill in this crucial position within the organisation. For more information on how to become a volunteer and skills/abilities required for this position go to the link below. IMECE currently has no vacancies.